Their marriage is one of convenience. But, sometimes, even the wrong path can lead to the doorstep of love. Thea Caulfield, daughter of an ambitious merchant, has no choice but to accept the deal made between her father and the Duke of Sandon. Away from her home and family, she finds herself trapped in a loveless marriage with a man she barely knows, and holding a title she never wished for. How will she ever survive this foreign, lonely new world of hers? An impulsive decision aimed to spite his overbearing mother, has led the Duke of Sandon to an impossible situation. Now, he has to find a way to melt the heart of a wife who seems to hate him and prove to his peers that he isn’t the pitiful joke they consider him to be. But is love possible for him? Or have his choices condemned him to a life of unhappiness? Two strangers, tangled in a web of duty and regret, will seek the path to understanding and trust, resisting a world that wishes them apart. 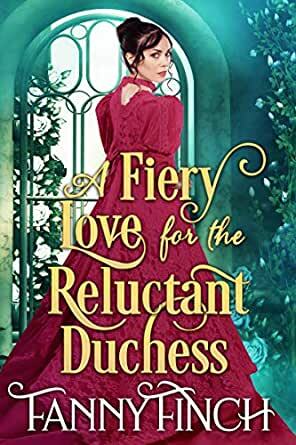 Buy “A Fiery Love for the Reluctant Duchess” and unlock the exciting story of Thea today! 2.0 out of 5 starsGreat Plot but honestly I felt cheated and can't understand other's ratings! This writer has no respect for 1. the English language ("Thea, come down, you need to speak to your father and I" and right on the first page-Thea is talking to a sister about a younger sister's education--"most of her education has been from you and I") WHEN you use two people--and don't know to use I or ME---you take off the first name and say--Thea come down, you need to speak to "I" ???) NOT_-you'd say speak to ME! and her education has been from ME (not I!!!!!)! THEN it wasn't till near the end I leaned the main character's name was Joseph--author keeps calling him "DUKE"?? THE DUKE over and over. THEN when he meets with his long time friend--they say "Hello Duke" and the friend replies, "Hello Duke" (This writer should read a novel by an adult and see how titled English Lords spoke to each other! THIS totally spoiled this story that had a chance to be a good one! Plot was good but the grammar and the constant "The duke did this and then "the duke" did that was horrible! This writer needs a course in the English language and then to read a historical novel by an adult writer! ALSO: the "heroine" is so bigoted against the wealthy and titled people and needs a huge rock to fall on her to see her error in thinking I could not feel anything for her. AND FIERY LOVE--it was not-there was not even smoke let alone fire! Thea Caulfield, merchant's daughter, and Joseph Tyndale, the Duke of Sandon, suddenly find themselves in an arranged marriage. Joseph has suddenly agreed to a marriage in agreement with Thea's father without consulting her, of course. The story shows how Thea and Joseph grow into a true relationship suitable for marriage. Mr. Rogers, the minister performing the ceremony gives simply stated but profound advice. Commitment and constant regard are key efforts. Both Thea and Joseph get advice. The advice sets the themes for the growth of the relationship! of love that any one man or woman can offer to another. Finch, Fanny. A Fiery Love for the Reluctant Duchess: A Clean & Sweet Regency Historical Romance . Kindle Edition. her that your love is not based upon what must be done,” Mr. Rogers said, urging him at the end. ... The love that you will choose to give. That love will be evidenced in those small ways. Finch, Fanny. A Fiery Love for the Reluctant Duchess: A Clean & Sweet Regency Historical Romance . Overall, this was a very nice read. The characters are well-thought out and you really want to see how their relationship develops and if their love blossoms. The author deals nicely with the social history of the era, introducing appropriate social conventions and assumptions and then playing on them and what is deemed "proper" throughout the book. The cons for me were that the book was a bit verbose in some areas, some of the foreshadowing was both heavy-handed and drawn out, and the book contained some stilted/unnatural conversations and inner dialogues of the characters (I understand they were having deliberately awkward relations at points within the book, but some of the language just seemed unrealistic/unnatural). Also, the title is a bit misleading; while she is certainly a reluctant duchess, I fear "firey" is a much too potent word to describe the love they share - more like "respectful and deep". Overall, a very good story with well-defined characters, good plot development with a fair amount of twists/turns/bumps in the road - I enjoyed it and would read more from Fanny Finch. I enjoyed reading this story. It's about a most unlikely marriage between a nobleman and a commoner. A marriage of convenience for both, as much as Thea was against it. Joseph's mother made a demand that he marry within a week after the season started. His fabric merchant was scraping by to support his wife and 5 children. They struck a deal; he would marry his oldest, Thea, thereby supporting her family and he would spite his mother by marrying "below his station." It does have a HEA with an extended epilogue occurring 1 yr after the marriage. Although I became weary of Thea's distrust again and again and skimmed a few pages of repetition, the book is very much worth reading if you're a fan of historical romances. I received an ARC of this book. This is my voluntary review. Thanks Fanny! 5.0 out of 5 starsAn enjoyable read!! Thea Caulfield wanted to marry for love. Instead she, the daughter of a merchant, married a Duke because he would support her family. He married beneath him to spite his mother. A marriage of convenience to a man she didn't know. The marriage was unacceptable to the Duke's peers because she wasn't in their class. It all was very trying for Thea. The Duke came to love his wife. How was he going to get her to love him? What happens when he loses his money? Is this her chance to get out of this marriage? Will he find a solution to his problem? Will it drive them even further apart? Or will she finally see the man she married? The plot is well thought out and well written. Characters are fleshed out.